My name is Cally and I am a self taught artist from the West Midlands creating whimsical, unique, mixed media pieces of artwork and creations. I love with my musician boyfriend Jamie and 4 wonderful cats in a lovely creative home. Watch this space for more updates! Finding the Alphabet in Wolverhampton! 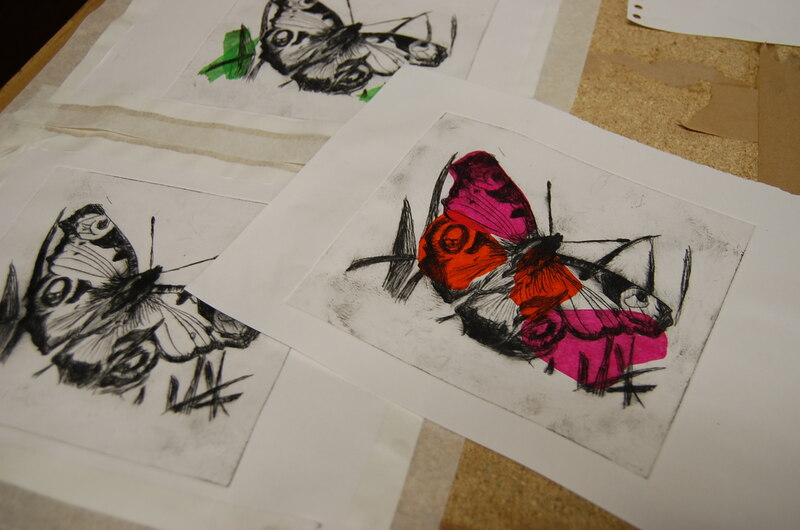 More dry point/ intaglio printing! Christmas Gift Tags for Sale! I thought I would share my first experiences trying out dry point printing at University. 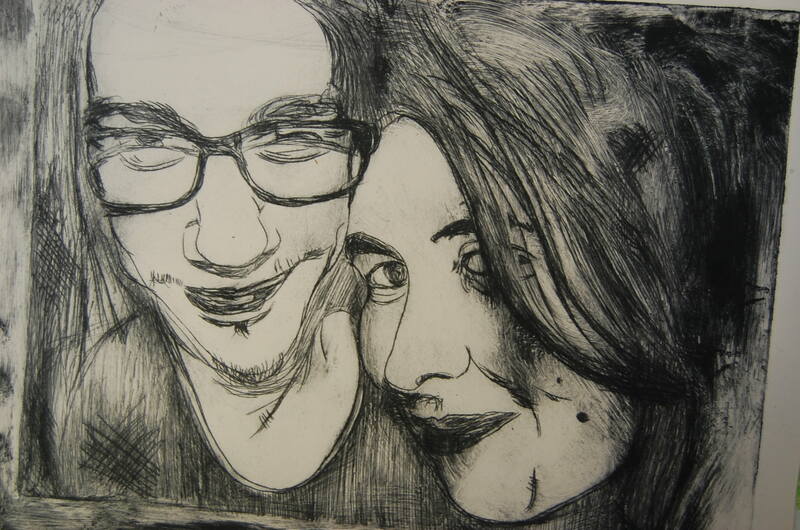 When etching my first design on plastic (below) of me and my partner Jamie, I didn’t think that the results would turn out as well as they did. I loved the whole process of dry point printing – I found it a lot easier than screen printing and lino printing, but the results were great. I can’t wait to experiment more. For the process, I wet the paper (so the print can be made) and rubbed oil based ink into the etch on plastic. I then rubbed away the excess ink and added shading with it where needed. I then placed the etching board down and put the damp paper on top. I then put them through the rolling machine, and taped down to dry. I enjoyed the process so much I decided to do another one. Above is an etch from a photograph I took of a butterfly. I used the same process as above but this time experimented with tissue paper to add colour. As you can see, the print on the right did not turn out as well as I’d have liked, because the tissue paper moved in the printing process. 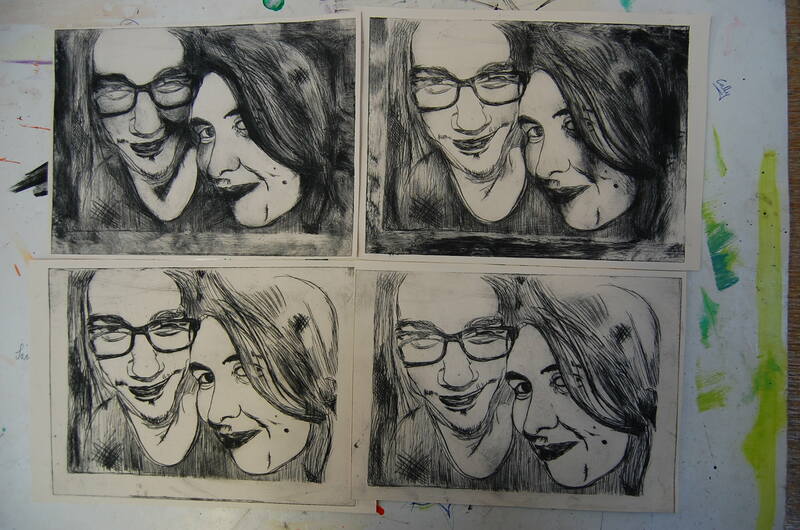 I will be doing lots more dry point printing next week, and can’t wait to show everyone the results. I am really looking forward to experimenting more with this way of printing, and hopefully putting some in my shop! What’s been going on with Cally’s Creations? I haven’t posted as regularly as I should, but I do find it hard juggling my blog along with Facebook, twitter, tumblr and Etsy. I hope that this will be changing now that I am attending Wolverhampton Uni to do Art and Design. My life is full of Art right now, so there’s rarely a time when I am not creating something new. In my foundation year we have been asked to create an art journal through out the year. I have decided to dedicate myself to this, and to never rip a page out. Ever! This has been difficult for me in the past as although my artwork does get a lot of positive comments, like most artists I always feel like I can do better/ or that it isn’t good enough. I am not doing this any more. The one thing I have learnt while being at Uni is that you have to keep your progress. Even if you’re not a fan of what you have done, it’ll become useful to you one way or another in the future. I have only been at Uni for a couple of weeks but already I have learnt a lot. I can’t wait to adapt the skills I am learning into Cally’s Creations. There’s a lot of places where my business needs to be polished up, and I am looking forward to making those changes and giving it everything I can. I will be posting regular updates on my art journalling and progression as an artist, so stay tuned!